Salvaging and restoring the Notre Dame Cathedral. Dann Cuellar has more on Action News at 11 p.m. on April 15, 2019. PHILADELPHIA (WPVI) -- The only saving grace to the devastation of the Notre Dame Cathedral fire on Monday is that most cathedrals, like the Cathedral Basilica of Saints Peter and Paul in Philadelphia, are made mostly of stone. And that is what one architectural conservationist says may ultimately save the bulk of the iconic cathedral in Paris. The roof of Notre Dame was made mostly of wood and that is what was engulfed in flames on a gothic structure primarily made of stone. A massive fire swept across the top of Paris' soaring Notre Dame Cathedral as it was undergoing renovations Monday. Dr. Scott Cooper is the CEO of the Academy of Natural Sciences at Drexel University. He has a history of restoring historic buildings. He says, "Much of its integrity will remain. Much of what's been lost is actually restoration. The spire you could see collapse this afternoon, that dates back 120 years. It replaces one that was much, much older but it was gone from the building for almost a century before Viollet-le-Duc decided to reinstate it." The fire may be extinguished at the iconic Notre Dame cathedral, but the heartbreaking damage remains. Here's a look at the powerful imagery inside and outside during the massive blaze. 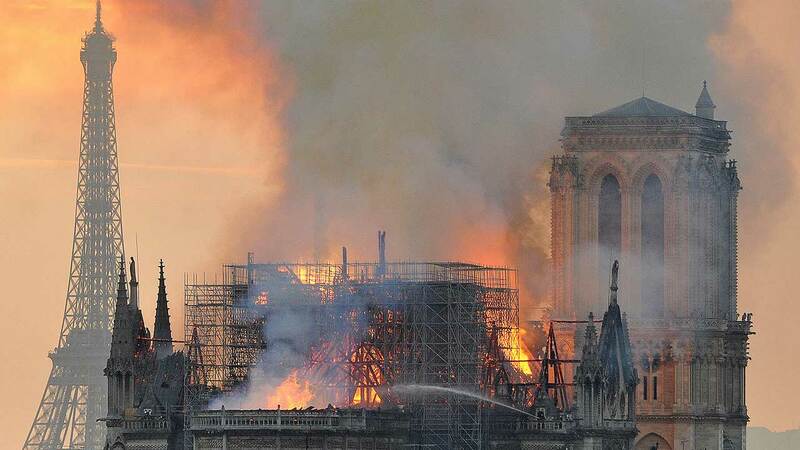 Despite the steeple being destroyed, France's interior minister has said firefighters are optimistic the main structure and the two bell towers can be saved. It's the buildings most celebrated artworks that remain in question, including the three stained-glass rose windows and the cathedral's most precious treasure, a relic venerated as the crown of thorns worn by Jesus Christ on his way to his crucifixion. "Nobody knows if that was for sure", says Dr. Massimo Faggioli, professor of Theology and religious studies at Villanova University. "But emotionally, for Catholics whether that was the actual crown or not, that has a value," he adds. 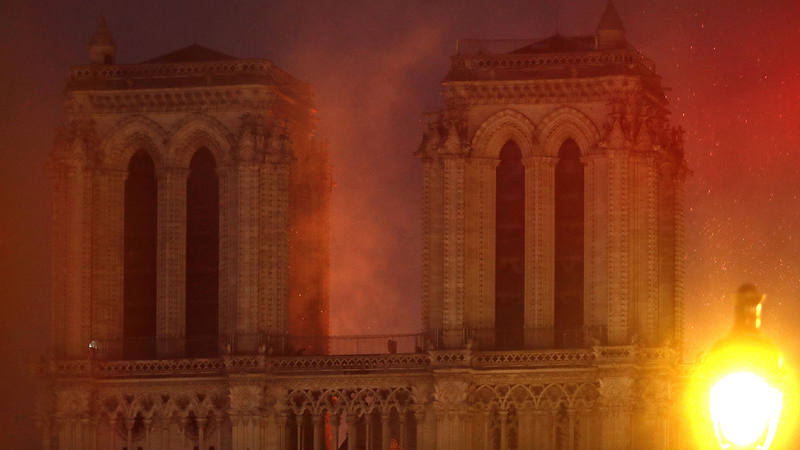 Faggioli says it's like a bad dream to see nine centuries of history, the place where Napoleon became an emperor, where Joan of Arc became a saint and so much more, be brought down in just a matter of hours by a devastating fire. It started five minutes after closing time. Shortly thereafter, thick smoke and flames were leaping off Notre Dame Cathedral into the Paris sky and it was all captured in real-time on social media. "It is very hard to replace that kind of symbol because in some sense, you see all those events been taken away with that fire," says Faggioli. Only time will tell what can be saved, restored or replaced. But Dr. Scott Cooper has every confidence the people of France will see to it that the iconic cathedral be restored to its vigor and dynamic glory.